American network television likes to ring in the season with the “Christmas episode,”— every show’s individualized take on the holidays. These episodes typically incorporate reconciliation, romance, the disintegration of social boundaries, and occasionally some supernatural element involving Santa Claus or angels. We look forward to these specials because they reaffirm our secret belief that the phenomenon of Christmas provokes a miraculous and all-encompassing harmony that infects all of humanity, regardless of individual beliefs. In the spirit of the season I unearthed my Twilight Zone DVD collection to see how Rod Serling responded to the holidays. Among the Bing Crosby and Jack Benny Christmas specials of the early 60s, the Twilight Zone produced two Christmas-inspired episodes: “Night of the Meek” (1960) and “Five Characters in Search of an Exit” (1961). The first is fairly conventional: drunken Santa gets fired for inebriation, stumbles upon a strange sac that inexplicably yields endless goods, begins handing out said merchandise to derelict neighborhood folk, realizes the value in charity, gets arrested for supposed stolen goods, watches as mysterious bag fools cops by producing only empty cans and a stray cat, learns the meaning of selflessness, and assumes bizarre destiny as the real Santa. The second episode is far more cryptic and far less Christmas-y. 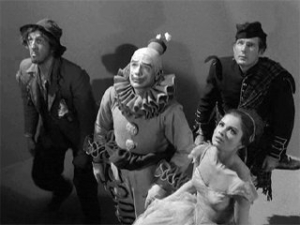 Five stock characters — a soldier, a ballerina, a clown, a hobo, and a bagpiper — find themselves in a bizarre round room without doors or windows. The only concrete clues about their surroundings are a distant open ceiling far out of their reach and the sound of an epically loud bell ringing. They lack any recollection of who they are or how they got there, but they possess the faculties to speculate on the nature of their circumstances, which they guess is anything from insanity to space travel to hell. They develop a plan to stack their bodies up the wall so one of them can reach the top ledge and gain some perspective. After one failed attempt they succeed, but the soldier leans too far and falls over the side, stiff bodied, into a pile of snow. The perspective shifts and we’re on a city street; turns out the five characters are actually dolls and the round room is a donation barrel for an orphanage Christmas toy drive. A child standing nearby picks up the soldier doll and throws him back into the barrel. She leans her body down into the opening. “You don’t have very many, do you?” she asks the woman ringing the donation bell. The volunteer expresses hope for a good donation season, and the camera pulls back leaving us with Rod’s epilogue. This episode falls comfortably under the Twilight Zone sub-category of imagined-personal-hell-that-turns-out-to-be-a-weirder-reality (i.e. : “The After Hours,” “Eye of the Beholder,” “The Midnight Sun”). It’s also refreshingly self-reflexive, particularly when the characters list off potential explanations for their bizarre situation in a way that echoes the viewer’s analytical experience. In the grander Twilight Zone repertoire, though, “Five Characters” falls flat. It’s not particularly shocking or memorable and at first appears to be haphazardly thrown together and hitched onto the Christmas bandwagon. One fan blogger called it “a half-assed concept Serling got while staggering home drunk past a bell-ringing Salvation Army major.” The Christmas reference doesn’t come until the last 90 seconds of the episode and could easily be removed, leaving the narrative intact. But the Twilight Zone often operates on a multiple esoteric planes. On a superficial level, this episode is about the realities we take for granted and the supernatural forces we believe control our fates (in this case, the god-like child figure). On a social level Rod is making an elementary comment about consumerism. The characters, as people, are lost and purposeless, but as dolls they are part of a system: bought, discarded, recycled. They are destined for the hands of poor orphans, so they have more value as an object than they do as human beings. “Perhaps they are unloved only for the moment,” Rod postulates in his epilogue. “In the arms of children there can be nothing but love.” Et cetera, et cetera. On a Christmas episode level, though, something more profound is at work. Christmas itself is only an afterthought, tacked onto the end like a distant relative uncomfortably squeezed into a family portrait. Unlike its contemporaries, there is no transcendental spiritual experience or renewed faith in humanity. In their absence you’ll find a truer image of Christmas: a measly five dolls in an ambitious donation barrel as observed by an ignorant, privileged child. In faithful Twilight Zone spirit, Rod peels a corner back to expose the underbelly of Christmas — in this case, a rather ordinary snowy street where the only miracle is the irony of an orphan being gifted a doll that resembles a hobo.